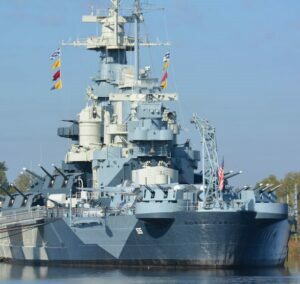 The USS Battleship North Carolina is an authentic on-board museum. As I have written in the past few posts, New Bern is perfectly located near really cool places. So, when you feel the need to get out and about beyond the city, you have plenty of options. A place I love to visit this time of year is Wilmington. The city is less than 100 miles down U.S. 17. There is much to do here, so I am breaking my visit down into two posts. This post focuses on three unique museums for history buffs. The first amazing sight to visit is the USS Battleship North Carolina. After the ship was commissioned and served in World War II, it was saved from scrapping through a campaign to bring it back to North Carolina. It has been authentically restored and is now a museum. Touring the battleship, you learn more about what the crews endured in wartime. You can explore several decks, including the bridge, engine room and berthing areas. Come on, they actually have an attraction named Cape Fear Museum? I had to see this for myself. Believe it or not, this place was worth the price of admission! The museum covers two floors, concentrating on North Carolina history, culture and habitats. Be sure to check out the Ground Sloth skeleton, a replica of a creature that lived over one million years ago in what became Wilmington. While there have been rumors the mansion is haunted, the only chills I got were from being awed by the majesty. Being from Florida (which to some is not really in the South), I appreciate the exquisite detail of antebellum architecture. The Bellamy Mansion Museum’s home and carriage house are the epitome of this architectural style, and they have been restored to their original splendor. As I walked through the different rooms and quarters of the 10,000-square-foot mansion, I wondered what it was like to live in the middle of the Civil War in North Carolina. Be sure to include some time enjoying the gardens, which are simply gorgeous this time of year. 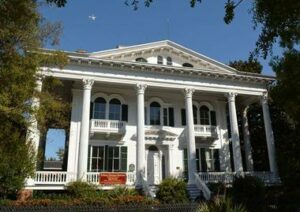 No matter what your taste in a museum, you will find plenty of browsing opportunities in Wilmington!